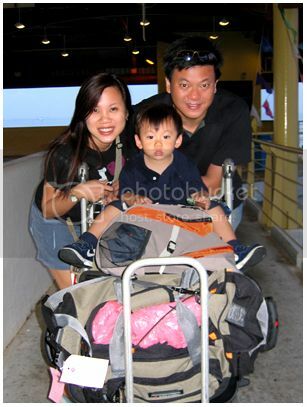 Back from Bintan! - A mummy's inane blabberings.. 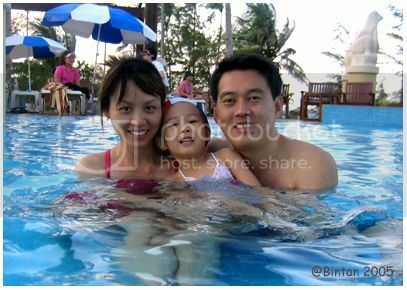 Spent 3 glorious days @Bintan! Fabulous weather, good company, delicious food (ooooh, the yummy pizza at Mana Mana!!!! ), what more could we asked for! The resort wasn't as crowded as I'd thought it would be so we had lotsa space to ourselves. 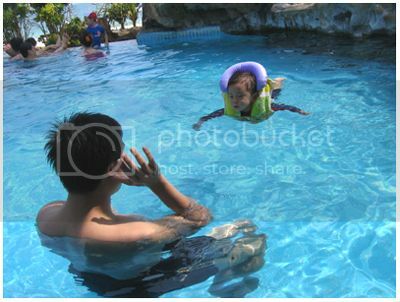 Aidan loved every moment of it especially the water! His skin is now a li' golden brown even though I'd lathered on him lotsa sunblock but he looks so cute with his rosy cheeks! 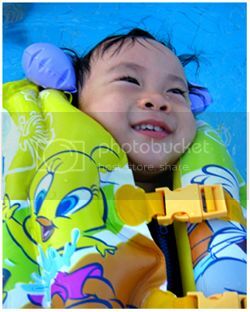 The kids enjoyed the pool the most.. Aidan wore the swimming vest for the first time and to his delight, he was able to float without us having to hold on to him and he could swim about all by himself just by moving his hands and feet! For once, he didn't need to just stay in the baby pool but we could move over to the adult pool where he was able to swim freely! The vest was a tad too big for him but he didn't mind it at all and even after we were out of the pool, it took a while for us to remove it 'coz he was so attached to it. I'm sure he would gladly slept with it on. Didn't managed to get any massages becuz my online appointment at Asmara was somehow screwed up..Gotta remember to call them up to ask for an explanation. Couldnt understand how it wasn't booked as a rep from Asmara actually called me up to confirm on the timing! Bleah! Felt bad 'coz I had booked for myself and my 2 other galpal. 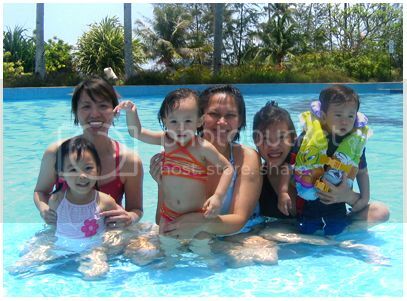 It was meant to be a relaxing time for us mummies, and our hubbies' turn to care for the kiddos! Oh well~ guess it wasn't mean to be! Well, tons of pics as usual :) Have taken today and tomorrow off to 'recuperate'. 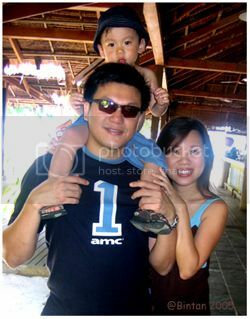 Meeting with Mong meganmacy and her 2 girls later coz she's back from Hong Kong for a short trip! Yeah!! 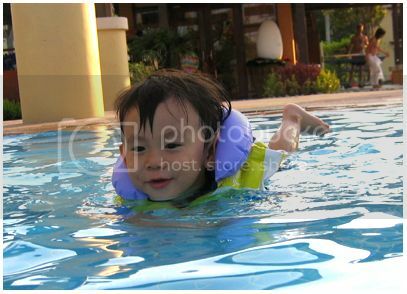 Heh..Gancheong Aidan couldnt wait to get to the pool! 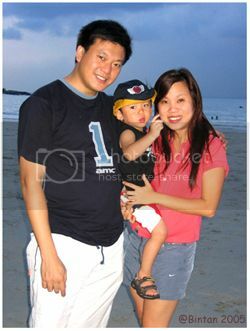 Met babemom joojanet and her lovely family @the resort too..
She doesn't look like a mom of 2 at all! 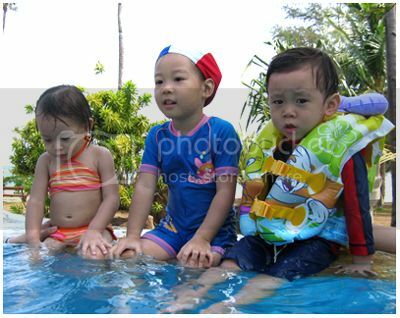 The 3 kiddos by the pool! The li' fish in the adult pool! Heh..look at his tanned face and cute mug..geram! Hiyoh! Aidan looks cuter and cuter everyday!!!! And you're positively glowing lah! This trip must've really damn shiok. Wasted that u couldn't get your massage though. heh..he's cute when he isnt throwing a tantrum. 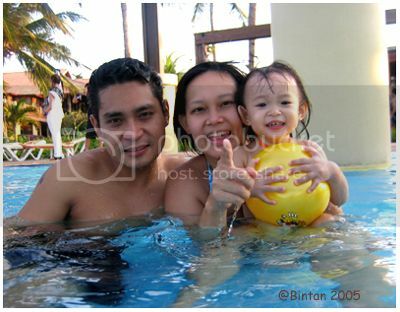 Man..he was really annoyed each time we had to take him out of the pool..even tho we explain that we'll be back soon..Thankfully, out of sight, out of mind..! Yeah..quite a relaxing trip..should have extended it though hehe..oi, wanted to comment in ur page yesterday but too tired but fwah, ur hair is really long liao leh! Lotsa singaporeans were there during the weekend. Wun be surprised if lots ljers were there too! guess what, i was on the same ferry back as your friend joojanet! 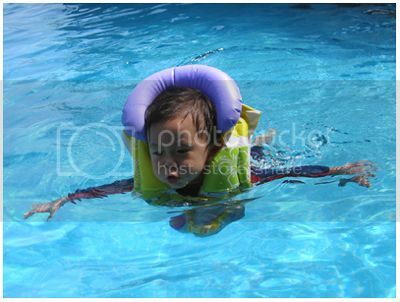 yeah..i love the pool! So big and warm! 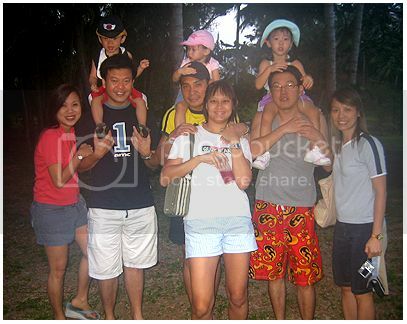 Heh..i think hubby and I should try golfing there the next time after reading ur post! Heh..u just went for a holiday right? Eh..why dun u n HM take a break sometime soon? 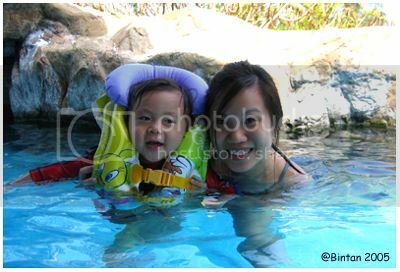 heh..he was jus ecstatic coz he gotta spend so much time in the pool and running abt in open space! aidan is getting more handsome!!! so nice that u had a great vacation!!! heh coming from u..u always seem to be flying somewhere fun! but yeah, it was a good break! 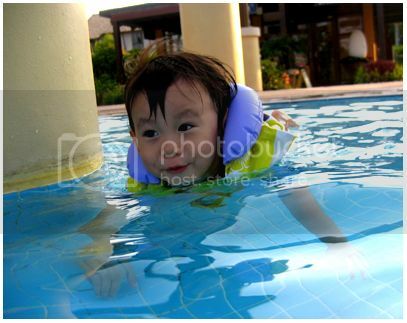 yeah, the kids pool doesnt allow him to float much..he could 'swim' so freely there! 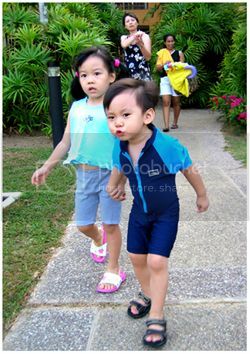 cute kids dun always make good looking adults..hehe but i can always hope! Seems like you guys had a great time! Thanks for sharing the photos. Hey, when can we meet for lunch sometime. Need to pass you the concealer and other stuff. wed is out..possibly thurs or fri. I call u when im at work then!!! U have the concealer at work right? Yes you look really good after you go back to work! More so after a break. Yo are glowing! but heh..it was indeed a good holiday! When's ur next one? Heh..why won't it come true? And u just had a holiday in malaysia right !Just plan ahead. Am sure u will enjoy the break! It should be getting warmer in HCM right? Heh, i think both you and Stephen are naturally fair..can tell by ur type of complexion (the creamy sort)..